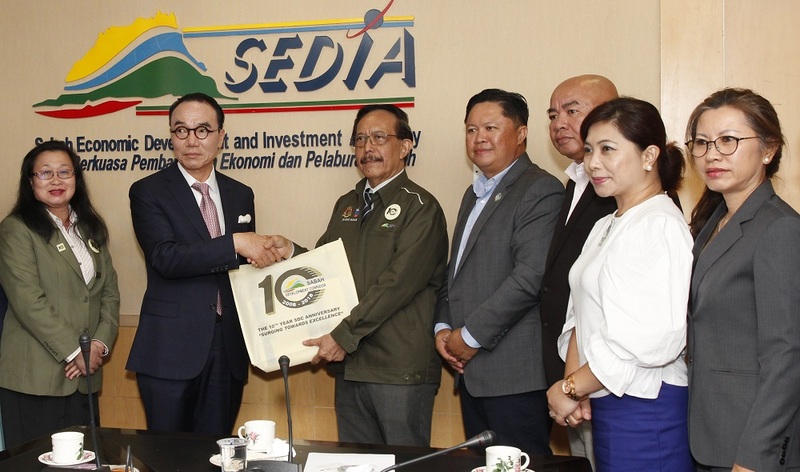 Kota Kinabalu (Friday) - The Sabah Economic Development and Investment Authority (SEDIA) today received a courtesy visit from REI Holding Group Inc. (REI). The delegation was received at Wisma SEDIA by SEDIA Chief Executive Datuk Dr. Mohd Yaakub Johari with several management and staff members. The visiting delegation sought to have a discussion on investment opportunities available in Sabah, particularly through the Sabah Development Corridor (SDC). The REI delegation expressed their keen interest to establish a greenfield medical tourism project in Sabah, combining a cutting-edge high-class medical facility with a six-star hotel. The project could see the technology transfer of modern medical technologies into Sabah as well as the region, introduce high quality medical professionals among locals, enhance the state's healthcare infrastructure, and feature Sabah as a new medical tourism destination in Southeast Asia. REI is an international investment company based in South Korea, integrated with strong investment management capabilities and competent experts in various areas. REI has maintained close partnerships with key global players while having accumulated experience and extensive knowledge in developing Dubai, which has been among the fastest growing cities globally as well as a world-class destination for business and tourism. SEDIA was established in 2009, and vested with the necessary power to serve as a decision-making and execution institution that is tasked with realising the SDC vision and mission, by being the One-Stop Authority to plan, coordinate, promote and accelerate the development of SDC. SDC was launched in 2008 with the aim to accelerate the growth of Sabah's economy, promote regional balance and bridge the urban-rural divide, while ensuring sustainable management of state resources. Through its role as the One-Stop Authority for SDC, SEDIA also provides investment incentives and measures to support investment entry into Sabah. Investment incentives offered under SDC utilise a regional approach, which differ from the sectoral tax incentives generally offered throughout Malaysia. Under SDC, investors are eligible for 100 percent tax exemption for a period up to ten years, available for specific regions or clusters as specified under SDC Strategic Development Areas (SDAs).